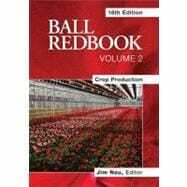 Offering detailed information on the production of 162 flower, herb, and vegetable crops, this essential resource for growers includes techniques and advice that work in real-life production, not just in the lab or trial greenhouses. Information is offered on how to decide what to grow, as well as tips on temperature, media, plant nutrition, irrigation, water quality, light, crop scheduling, and growth regulators. Details about propagation, growing, pest and disease control, troubleshooting, and postharvest care are presented and arranged by genus name. The plants represented in this compendium include annuals, perennials, flowering potted plants, herbs, and some vegetable bedding plants. Jim Nau is the greenhouses and gardens manager at Ball Horticultural Company, a recipient of the Perennial Plant Association’s Garden Media Award, and a speaker at gardening conferences across the nation. He is the author of The Ball Culture Guide and The Ball Perennial Manual. He lives in West Chicago, Illinois.